We all know that blue, that signature blue, that makes us think of the glass in the cupboards of the Turkey Hill kitchen, the particular brand of liquid dish detergent decanted in a glass olive oil bottle next to the marble kitchen sink or the dishware at Lily Pond Lane. Well, now that particular shade of "Martha Stewart blue" has spread itself upon the beautiful kitchen appliances of Kitchenaid, in a deal that is exclusive to Macy's. 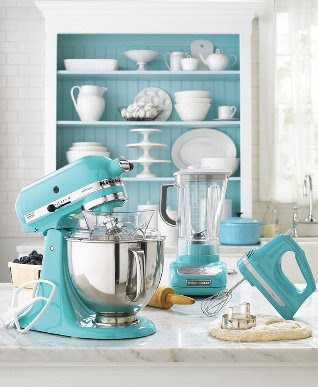 The classic Kitchenaid stand mixer, the hand mixer and the blender now all come in her trademark blue at Macy's. See order info below. I wonder when they will annouced the "good bed" mattress program .. I saw the logo recently on I think the slides the AGM .. I would love to get a Martha mattress to go with my Martha bed .. I'm usure as to why Martha is claiming Tiffany Blue as her original Martha Stewart Blue. All I can say is leave the torch alone. I'm pretty sure Martha was using a more greenish blue in the recent past, why the change now to Tiffany Blue? At least give proper credit to it if you're going to use it. Agreed. This has sparked a minor debate over at Apartment Therapy. I think Martha should address this.